Discussion in 'Headphones (full-size)' started by jude, Mar 14, 2018. Are You Team Blue or Team Copper? With extremely advanced (and integrated) head tracking to create an uncanny sense of surround realism, the Audeze Mobius is something far greater than just a gaming headset (though it is that, too). It's also an Audeze audiophile-class planar magnetic headphone, an LDAC-enabled Bluetooth headphone, and more. The Mobius is a highly sophisticated mixed media platform, and it's amazing. bhima, TWidXugA, menuki and 12 others like this. The Mobius is perhaps the most ambitious product we have done. It is different than any other headphone in the market both in the feature set and sound quality. It is our first Bluetooth Headphone. Supports USB-C and Analog as well. Light-weight and Comfortable, you can use it for hours. It has an accelerometer and gyroscope that tracks your head-movements every milli-second and creates amazing 3D audio, unlike any other headphone in the world. The last few months we have given quite a few demos and in almost every case watched the jaw drop. 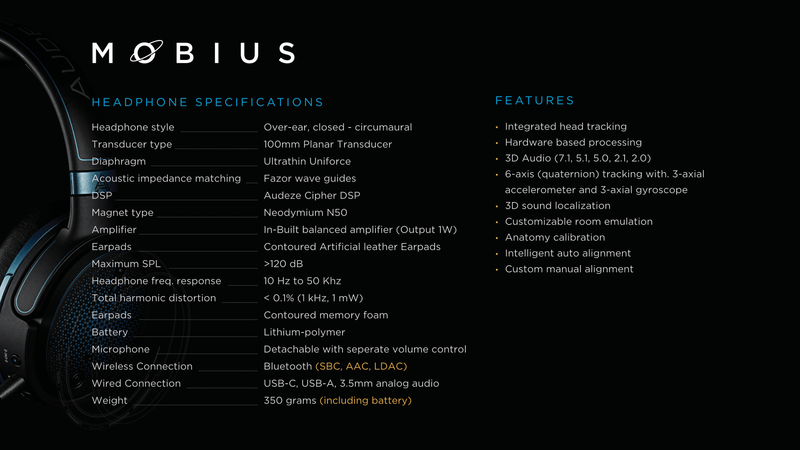 For gaming, movie-watching, Vr content creation, there is almost no other headphone that does what Mobius does. The headphone is ready, but we have no idea about the demand. So we have put it on IndeiGoGo for a month. If we pass all certifications, Shipping starts in June. If you are in LA area, drop by and try the Mobius at our office. Really proud of the team at Audeze for pulling this off. bhima, Wilashort, TWidXugA and 16 others like this. Impressions coming soon...very soon. As in, nearly one of my review's worth of impressions (though not finalized). Expect it in a few hours. twiceboss, Mshenay, reddog and 7 others like this. Wow. Nice. Is this the wireless alternative to the iSine Headphones? Spoiler: What I Use On The Go. PORTABLE RIG: COWON PLENUE R/AUNE M1S/JBL CHARGE 3/HIFIMAN EDITION S/TRINITY AUDIO: PHANTOM MASTER/FINAL AUDIO DESIGN F7200/CTM VS-2. Holy Cow! Head tracking on TOP of surround? LDAC?? This is like the AWOL Ossic crowdfunded headphone... except basically ready for market. Is this a licensed HRTF? True innovation from Audeze, and an incredible value proposition. Basically a wireless EL-8 (maybe even better?!) plus the most advanced spatial positioning in the industry. Wilashort and reddog like this. It's the real deal man. acia, Wilashort, reddog and 1 other person like this. Oh sick, so in addition to the unique copper, it has Tron-Blue too? I'm excited for this. Based on what it does and what it can do, this looks like a very promising headphone. I think you’re going to be overwhelmed by the incredible demand. I’ve already helped sell quite a few of these . The fact that these are Bluetooth planar headphones with LCD series tuning is incredible enough, then you added the spatial positioning tech and made it even more innovative. Honestly surprised how much the wireless planar angle is downplayed, huge accomplishment at this price range! i'm sort of confused as to why it's so gaming oriented. a lot of games where you control where the character looks with your mouse or controller wouldn't need this sort of technology. the audio "moves" when you move where your character looks. the only "gaming" application I can think of is for a triple monitor setup for racing or if some baller is gonna game in vr. Fotopaul, Wilashort, MICHAELSD and 1 other person like this. I’m confused as well. I feel like these are innovative media headphones that are also the best gaming headphones on the market rather than vice versa. Probably by far the best-sounding wireless headphones not just for movies and games but also music. They really bet on the gaming aspect of it, which may serve them well when virtual reality is more mainstream, but what they have created even excepting that is remarkable. huge accomplishment at this price range! Maybe im missing something,but what is the price? Looks very cool,but like everything else price will determine just how cool. $199-$299 on Indiegogo, $399 retail price. Wilashort and Monsterzero like this.